[2009 Limited Edition] When we got in from the cold yesterday, rather than warming up, we jumped into the freezer and pulled out the very tempting Maple Blondie. One of our fellow ice cream fanatics was nice enough to send over an email that not only mentioned that Maple Blondie is now available, but that her and her husband had split on how good it was. She thought it was great,while he thought it was just too sweet. Hmmm, sounds like we have some investigating to do. 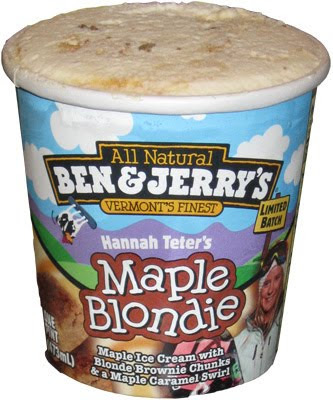 Here is a very fresh container of Ben & Jerry's Hannah Teter's Limited Batch Maple Blondie Ice Cream. If you are wondering who Hannah Teter is, she's an 2006 Olympic gold medal snowboarder who is currently trying to raise $300,000 to provide a better life for the people of Kirindon, Kenya. Not only is she trying to save a child, or even a family, she's trying to help the entire community and I think we all wish her the very best of luck in reaching her goal. Ok, back to the ice cream. What you see before you is maple ice cream with blonde brownie chunks and a maple caramel swirl. Your eyes went straight to that giant brownie chunk didn't they? It's ok, it's hard to miss. Now, not only does it look tasty, but it has a nice mild aroma of brown sugar. Mmmmmmm, I can't wait to dig in and see how many brownie chunks I can find! You know what? I really like this ice cream! It is definitely very sweet, borderline too sweet even, but it is hitting the spot after 2 hours of clearing a foot of snow from the driveway. Funny thing is, I'm not even that big a fan of maple. Sure, I can't eat pancakes or waffles without syrup, but I go with Aunt Jemima or Mrs. Butterworth. I've spent my life with these two and whenever I've tried real maple syrup, I find that it's just not my style. Wow, I'm having a little trouble stopping at the moment. I can't believe I've been won over by a maple flavor. It's very sweet, but it just goes so well with the excellent texture and quality of the Ben & Jerry's ice cream. I could easily finish off this container right now. The excuse I would use? I'm looking for brownie chunks! I can't resist a taste brownie chunk and these ones are quite good. They do vary in size, but they have a nice and somewhat chewy texture for something that's frozen. Chewy really isn't the right word though. I say chewy and you're thinking bad thing, but I mean it in a good way here. (if you can think of the right word to use, let me know). I have been won over by the limited batch and I am very ok with that. Maple fans will love this and I'm guessing the majority of the rest of us will greatly appreciate it as well. The worst thing I could say is that part of me wishes there was a brownie bit in every bite, but hey, absence makes the heart grow fonder. Great job on this one, thanks for the snack! On Second Scoop: Quality stuff, no denying it. If you love maple, go buy a few pints. If you want something sweet, go buy a pint. This one's different, but you should definitely try it. 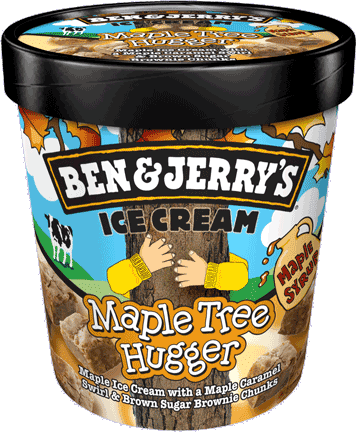 2013 Update: If you were ever curious about why this one didn't come back, well, rest just a little easier knowing that it lives on in Australia as Ben & Jerry's Maple Tree Hugger Ice Cream. I haven't seen this in stores here yet, but I really want to try it. I loves me some maple. OMG I love anything flavored maple. This ice cream has to be fantastic! I haven't found it..just now was referred to it...Was very excited until I read the ingredients...YUK! I do not like my ice cream with chunks of cake in it...So, back to Friendly's..(If I could ever find one down here. )Used to have MAPLENUT/Maple Walnut ice cream ALL OVER THE North... Worked in a creamery as a kid...YUM...'ONLY Maple and English Walnuts in my Ice cream...PLEASE! Do they still have this flavor? it's come back a few times now so it wouldnt surprise me if it makes another limited run this year. OMG!! i am really craving for it!!! Anyone know where to get it?? Really craving for it. anyone know where to get?? or can order from ONline?? Hannah's flavor was only temporary and Vermonster is actually in Europe (don't ask me why). Sorry.